Ever so often, we are blessed with the generosity of others and we hope you know how much it is appreciated. Here are a few examples of what some have done for us. There is much more from others who wish to remain anonymous but we hope from the bottom of our hearts that you know that without you, we could not continue. 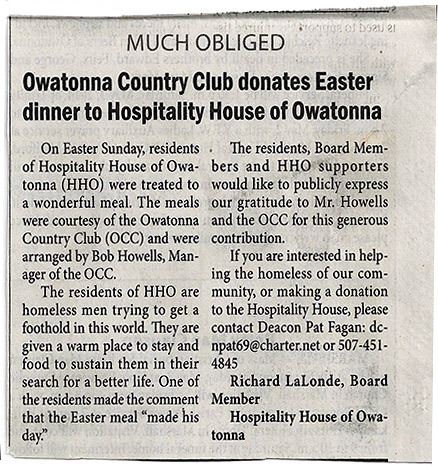 Recently we were visited by a good sized contingent from the Owatonna Foundation. When we moved into the house on the corner of E Main St and Grove Ave nearly two and a half years ago we were told that the roof wasn’t in too great shape. From the ground it didn’t look that bad, so we hoped to get several more years out of it until we had funds enough to get it worked on. But that could be like having a 5-year plan and putting it off a year during each annual review of the plan. There always seems to be something a little more important than a roof which limited funds can go towards in helping our guests. The Owatonna Foundation came to the House to see how much work was necessary on the roof and if what was needed was in line with their charter of assistance. We are very grateful that they decided in favor of assiting us with the repairs by making funds through their grant available to Hospitality House. This is a marvelous example of how a caring and generous community helps those in need – Helping the Helper. The Board of Directors for Hospitality House offers you our thanks, as I’m sure all the guests we serve do also. May, 2014—our utility bill was paid—Thank You! !